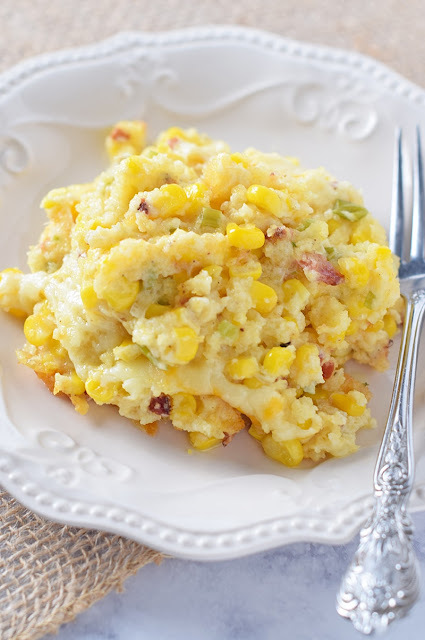 Creamy Bacon Corn Casserole, made with simple ingredients like cream cheese and cornbread mix. So delicious, one of my family’s favorite side dish recipes! 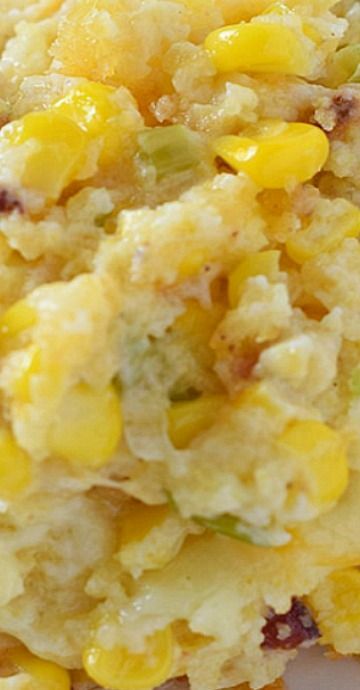 Creamy Bacon Corn Casserole is easily one of my family’s favorite side dish recipes during the holiday season. We usually make it every Thanksgiving, Christmas too and sometimes Easter. Creamy Bacon Corn Casserole, made with simple ingredients like cream cheese and cornbread mix. So delicious, one of my family's favorite side dish recipes! Cook the bacon and set aside. In a medium saucepan, add cream cheese, heavy whipping cream, salted butter, sugar, and sour cream. In a large mixing bowl, mix together the cream cheese mixture, crumbled bacon, minced green onions, frozen corn, JIFFY Corn Muffin Mix (1/2 a box), salt, and pepper. Spray a 13"x9" baking dish with cooking spray. Pour the casserole mixture into the baking dish, making sure it's evenly spread throughout the dish. Add shredded cheese to the top of the casserole, and bake an additional 10 minutes. 0 Response to "CREAMY BACON CORN CASSEROLE "